"It was in 1986, the first time. It happened right over there," Mohammed Ahmed Nassar Nuwajah told VICE News. "The Israelis chased us out and destroyed everything. Nothing is left of the village were I was a child, and soon there may be nothing left of where I live now." 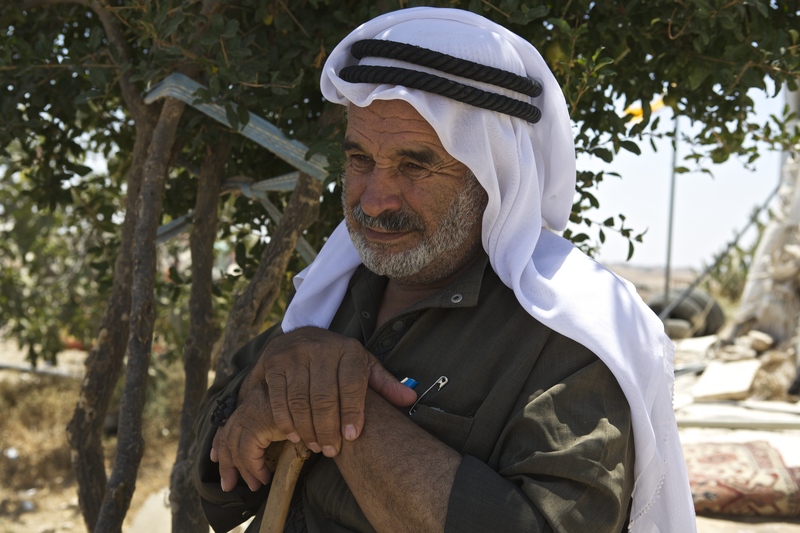 Nawajah, a 70-year-old retired sheep farmer, spends most his day sitting in the shade of the olive trees, holding court and disciplining his 42 grandchildren; whose maverick pastimes include trying to swim in an Oxfam water delivery truck. But when he's not chasing the next generation with his walking stick held aloft, he worries deeply about their future. Over the last three decades, Khirbet Susiya, a small Palestinian village in Area C of the occupied West Bank, has been rebuilt and destroyed four times. The villagers, already forced off much of their ancestral lands by Israeli settlers, have been squeezed onto a small patch of grass where they also keep their goats and sheep. Unable to get building permits they live in a ramshackle collection of tents and semi-permanent concrete structures. With no piped running water or stable supply of electricity, the living conditions are grim. Village elder Mohammed Nawaja worries about his grandchildren's future in a village that has been demolished four times in the last thee decades. Photo by Harriet Salem. "In the summer it's like an oven and in the winter it's like a freezer. It's not a good place for a newborn or elderly to live, or anyone really," said Sameha Nawaja, Mohammed's niece. "[But] it's our home, our sheep, our bees, our trees, and our land. We don't want to live anywhere else. We can't even imagine it." The threat of bulldozers, however, is once again looming large. On July 12, Major General Yoav Mordechai, a senior commander in the Israel Defense Forces, arrived at the village with a team of surveyors. According to an army map half the encampment, around 37 structures, have been earmarked for destruction following a "good grace" period for the Muslim holy month of Ramadan — a deadline that expired several days ago. Ostensibly Israel has justified the upcoming demolition of the village on the grounds that it was built illegally. But Rabbis for Human Rights, an NGO that has provided legal support to Khirbet Susiya's residents, says that the Israeli courts and army have blocked all attempts to obtain planning permission for the land, which documents show has been owned by the villagers since the 1800s. "We've tried everything to get permits and legalize the buildings in the village," Yariv Mohar, a spokesperson for rights group, told VICE News. "The reasons given by the court for rejections are outrageous; a plan we put forward in 2013 was rejected on the grounds that it would be unfair to make people live in these isolated conditions. This is ridiculous if you think about the settlement that is being maintained just next door." Just a few hundred meters up the road, Susya, a gated Israeli settlement that is illegal under international law, is a stark contrast to the villagers' encampment in the valley below. Built in 1983, this community has a park, stores, a community center, and regular modern amenities. Electricity pylons dot the hilltops and running water is provided via an underground pipe system. In comparison to the nearby Israeli settlement living conditions in Khirbet Susiya are basic. Water has to be drawn from wells, many of which have been destroyed in demolitions. Electricity is taken from donated solar panels. Most families live in tents deemed illegal structures by Israel. Photo by Harriet Salem. According to Mohar the residents of the settlement — supported by Revagim, a right-wing Israeli NGO that has called the villagers "squatters" — are behind the latest eviction petition. Among the groups' claims to rightfully own the land is the presence of a fourth century synagogue with Hebrew mosaics that has been excavated from beneath the original site of Khirbet Susiya. "The encampment is strategically placed between the Jewish community of Susiya and the Susiya archaeological site. Their agenda is clearly intended to obliterate the fact that an ancient Jewish community, including a magnificent ancient synagogue, thrived in this area before Islam even existed," the NGO wrote in a recent op-ed published in the Jerusalem Post. However activists point to the much broader discrimination against the 180,000 Palestinians living in the Israeli controlled Area C of the West Bank where building permits are rarely granted to non-Jews and demolitions of illegal structures are frequent. According to B'Tselem, an Israeli human rights group, in the South Hebron Hills alone more than 1,000 people "live under perpetual threat of expulsion" due to threats to knock down structures built without proper permissions. For the residents of Khirbet Susiya, however, there is a small glimmer of hope. Nearly 30 years after the first eviction their plight has caught international attention. At the entrance to the village a small marquee has been set up. A vat of weak coffee and stack of #savesusiya pamphlets are laid out on the table to greet guests. Among the recent visitors are a group of American consular officials, a European Union delegation, senior representatives from Action Aid Australia, and a whole host of other rights and humanitarian groups. Last week, thousands of miles away from the tiny village, John Kirby, the spokesperson for the US State Department urged Israel to halt its plans. "Demolition of this Palestinian village or of parts of it, and evictions of Palestinians from their homes would be harmful and provocative," he told reporters. "We are concerned that the demolition of this village may worsen the atmosphere for a peaceful resolution and would set a damaging standard for displacement and land confiscation, particularly given settlement-related activity in the area." But it's not just statesmen in smart suits that are throwing their weight behind Khirbet Susiya. On Friday around 500 activists marched in protest against the plan to evict the villagers from their land and scores of volunteers from countries across the world — including dozens of Israelis — are also helping to defend the village by staying overnight in shifts. The residents, however, remain cautious about the long-term success of the campaign. "We can't believe how much attention there has been to our village and we're grateful for all the support," said Sameha. "[But] in my opinion they'll wait until all the foreigners have gone and when the world is no longer looking they will come with their bulldozers in the middle of the night."